Le Reve is an aquatics show at the Wynn in Las Vegas. I have not been but hope to see this when I am at the Magic show in August. 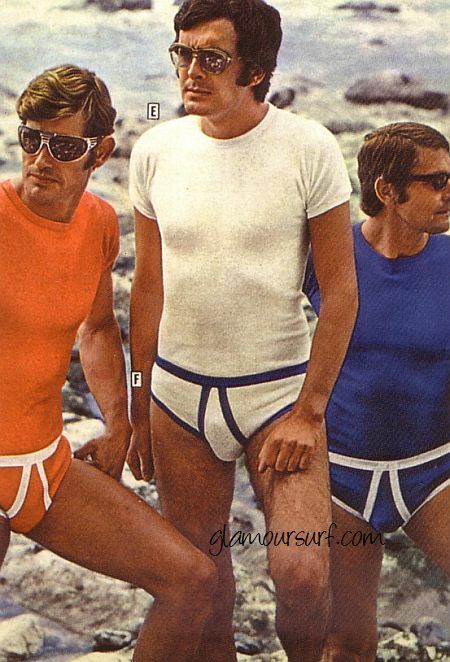 And matching underwear to boot. Hot diggity! The bikini, designed by Susan Rosen with Steinmetz Diamonds, contains over 150 carats of D Flawless diamonds. Some of the diamonds are the rarest in the world including a 51-carat, pear-shaped diamond, a 30-carat emerald cut, a pair of 15 carat rounds and a pair of eight carat pear shapeds. 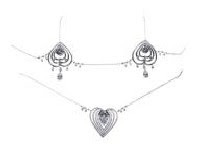 The stones are set in platinum for one valuable and very tiny bikini. So I'm asking you, would you wear this? I received these images as a group of gift cards (which I love to send to my customers). Each time I pulled them out I'm captured by their beauty, how time itself stands still and I can view into the lives of each of the subjects. Not posed, just life in all of it's details. Candid and approachable in the sense that I can bring my own questions to their lives and hope that I can find some of the answers within the framework of the photograph. "Leaving aside the mysteries and the inequities of human talent, brains, taste, and reputations, the matter of art in photography may come down to this: it is the capture and projection of the delights of seeing; it is the defining of observation full and felt." Reacting against the Pictorialist tradition of Stieglitz, Steichen, and others of the preceding generation of photographers, Evans banished all artiness and artifice from his practice and let the subject—be it a West Virginia coal miner, a roadside vegetable stand in Alabama, or a torn movie poster on Cape Cod—reveal itself directly to the viewer with exquisite candor. He recorded everyday life in many forms—popular culture, the iconography of commerce and consumerism, the automobile and its impact on the landscape, new poverty, old wealth, and everything in between. Walker Evans began to photograph in the late 1920s, making snapshots during a European trip. Upon his return to New York, he published his first images in 1930. During the Great Depression, Evans began to photograph for the Resettlement Administration, later known as the Farm Security Administration (FSA), documenting workers and architecture in the Southeastern states. In 1936 he traveled with the writer James Agee to illustrate an article on tenant farm families for Fortune magazine; the book Let Us Now Praise Famous Men came out of this collaboration. Throughout his career Evans contributed photographs to numerous publications, including three devoted solely to his work. In 1965 he left Fortune, where he had been a staff photographer for twenty years, to become a professor of photography and graphic design at Yale University. He remained in the position until 1974, a year before his death. There is no other more important accessory for me at the beach than a wide brim over sized sun hat. Raffia or straw work best as they are naturally ventilated and the extra wide brim acts just like a parasol to keep the sun and sand at bay. 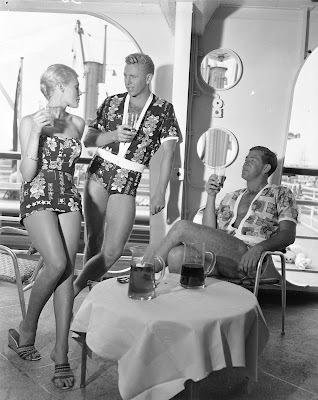 How do you glamorise and accessorize your swimsuit? We've been contemplating where to take our next vacation, so I've been busy looking at sites with some lovely and sometimes large pools. 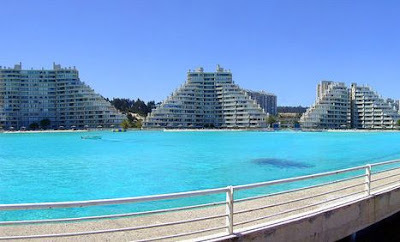 Today I share some upscale luxury swimming pools around the world found during my hunting. These are just a few of our favorites. The Joule Hotel in Dallas has a fabulous rooftop pool that overhangs at the side of the building. Now that had to require some architectural genius and the evening lighting ads a touch of elegance. The world’s largest swimming pool and artificial lagoon, according to the Guinness World Records, is located in the resort of San Alfonso del Mar in Chile. 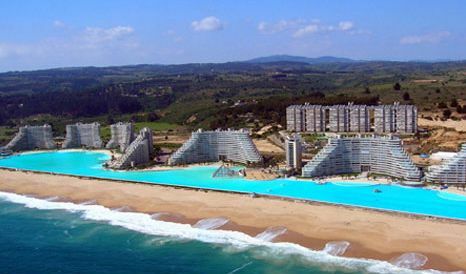 This pool actually dwarfs many natural lakes that attract visitors throughout the world. It contains 66 million gallons of water, is eight hectares in size and is equivalent in size to 6,000 standard domestic pools. 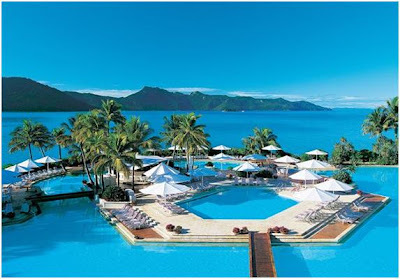 Hayman Island is home to the largest swimming pool in the southern hemisphere including the famous Hayman Pool which is seven times the size of an Olympic size swimming pool. Hayman Island is nestled in the spectacular Whitsunday Islands, close to the Great Barrier Reef, off Australia's north Queensland coast. This Whitsundays resort is the most northern island in the Whitsunday Islands group and is renowned for its elegance, service and superior location. 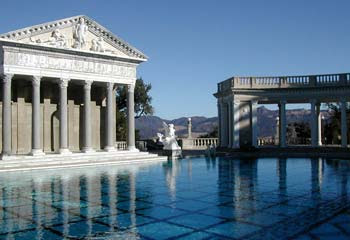 The infamous pool at Hearst Castle in San Simeon Ca. You can take tours here but unfortunately, no swimming allowed. 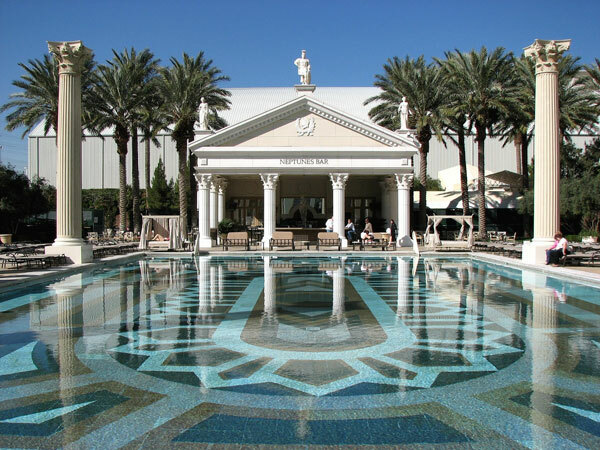 I'd say Ceasars Palace took a cue from Hearst when it designed one of it's many pools, located at Ceasars Palace in Las Vegas. 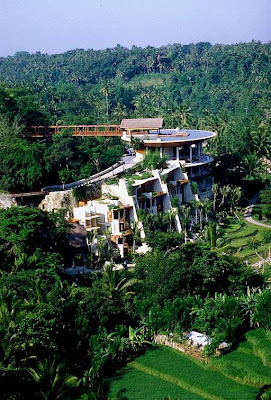 Four Seasons Resort Bali at Sayan overlooks the terraced rice fields that rise from the sacred Ayung River. 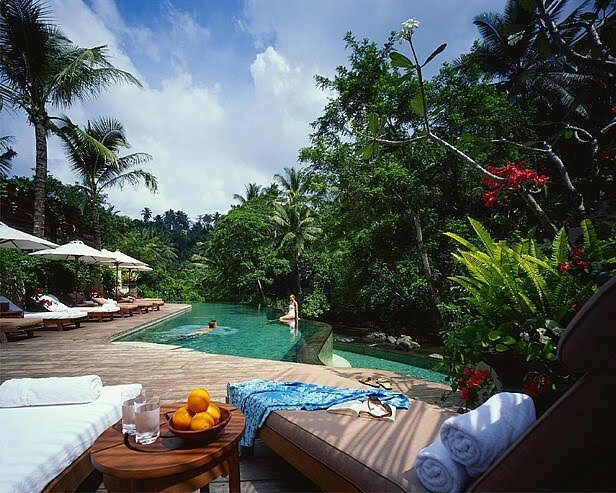 The resort is a striking design that houses its suites, health club, spa and restaurant in a main building with the villas arranged over the hillside leading down to the river. One of more than 17,000 islands in Indonesia, Bali is beautiful almost beyond belief – offering hillsides lined with stepped rice paddies, soaring volcanoes, lush forests and beaches lapped by the warm, crystal-clear waters of the Indian Ocean. It has close to 20,000 temples and countless palaces, a legacy of the eight ancient kingdoms that once ruled the island. In Bali’s central highlands, rice terraces and cascading water gardens share the jungle with ancient shrines and eye-catching heliconias. Now this looks like my kind of get away. I can so picture myself in this outdoor spa. 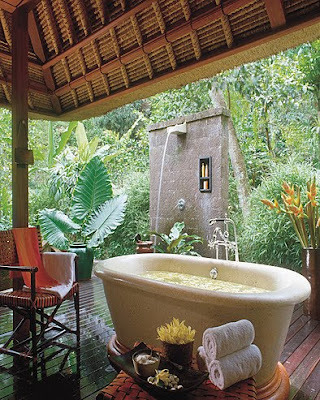 The outdoor shower, and that tub for soaking. Total Zen & Relaxation, I think the four seasons usually gets it right. 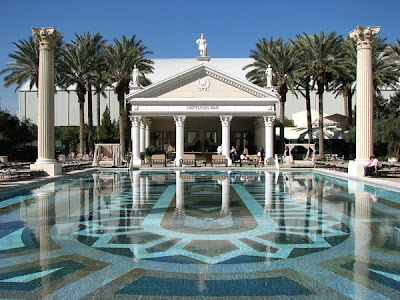 Do you have a favorite pool you'd like to share with me? 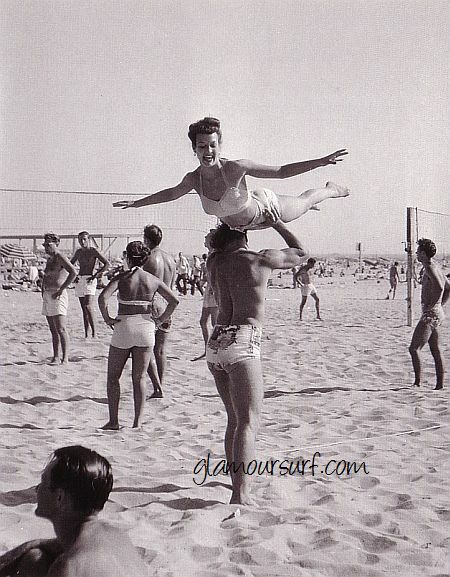 We spied some very cute retro inspired swimsuits over at J Crew today. This all over ruched bandeau tank is one of our favorites. and it comes in 3 different colors. A glam bandeau tank, which comes in an assortment of 5 different colors. This solid ruched hater swimsuit comes in 8 different colors. A ruched high-waisted bikini bottom, you can mix and match with some other fun tops they have. And it comes in 5 different colors. It also looks like they are having a sale of 20% off of all orders over $150. 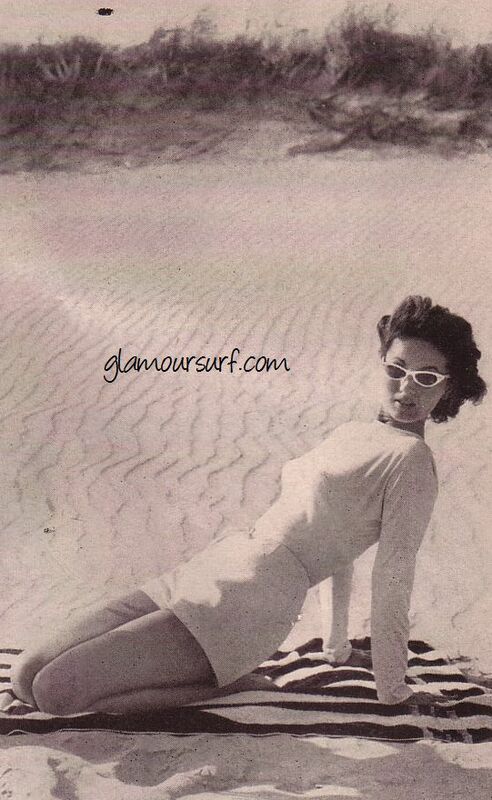 See website for details and tell them Glamoursurf sent you! 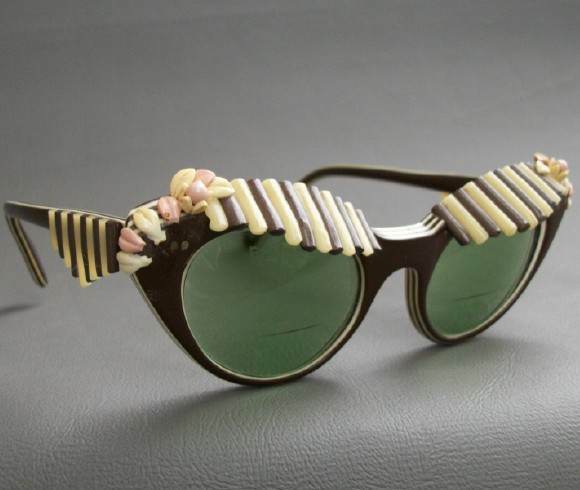 Aren't these just about the coolest vintage cat eye sunglasses you've ever seen? What makes them even more special is that they are by none other than Elsa Schiaparelli. You can find them up for auction right now on EBAY from fellow VFG member SecondLooks. This same frame sold at Doyle Galleries in New York in 2006 for a mere $1400. Swoon! It's here. 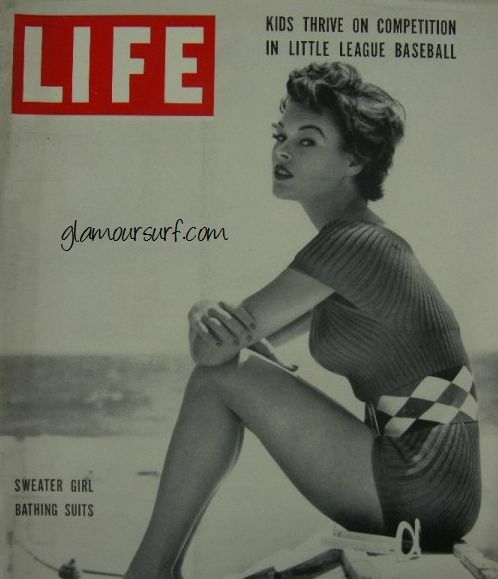 As mentioned in this post I ordered this June 28, 1954 issue of Life magazine on the promise of 'Sweater Girl Bathing Suits.' I'm so happy I did because just look at these beauties! Most are made without linings, boned bustlines or other artificial shaping, the sweater girl effect is obtained by using tight-fitting jersey or elasticized wool knit. Their high necklines and very long sleeves will present a tanning problem out of water, but their simple cut and elasticity make them comfortable for swimming. High neckline and horizontal stripes in one piece style are reminiscent of bathing suits of the Twenties. The halter back can be unbuttoned to make a suit strapless for sunning. Long sleeves contrast with the off shoulder neckline in a striped suit. It's top, cut exactly like a sweater, is made of elasticized wool jersey to stay down offer unseen shorts. 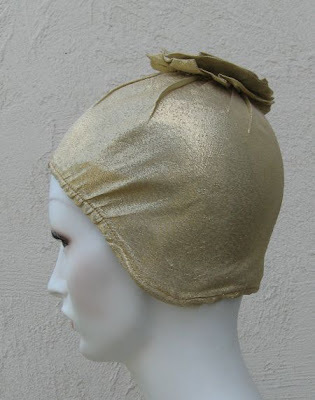 Attached hood and high back set off bare arms in one-piece wool knit jersey suit, the hood will not replace a bathing cap but it can be folded into a high turtle neck for swimming. Partly covered top exposes a little bit of neck and arm below the shoulder in one piece unlined elasticized wool suit. 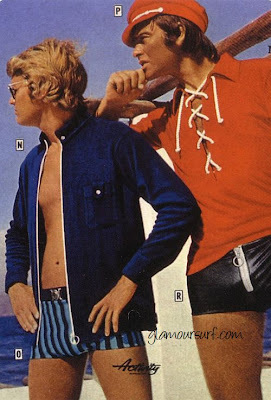 Fully covered top of rayon jersey attached to sharkskin shorts has boned lining but is cut like a simple T-shirt. 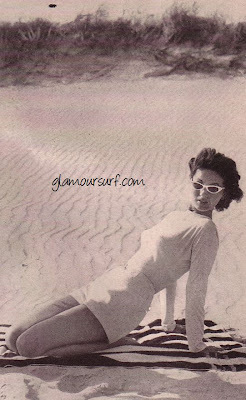 Jantzen Swimwear photographed by Australian photographer Gervaise Purcell for advertising and promotional purposes. 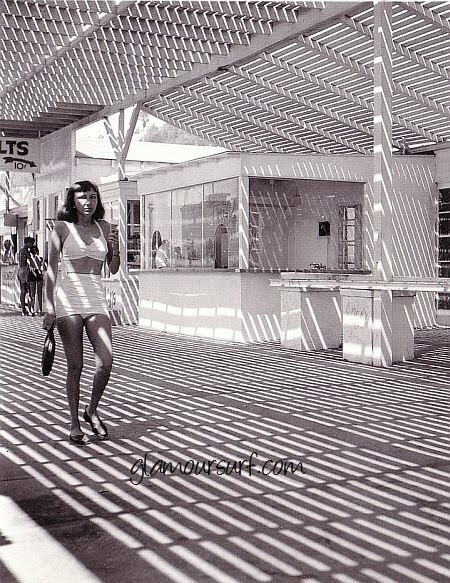 I haven't been able to find out much about this photographer other than he did have his own studio in the 1950s. His career spanned 1936-1983 and he began with aerial photography. In 1942 he began his career in the army and his first solo show in 1943 raised funds for prisoners of war. For the next 30 years he concentrated on fashion and commercial work. 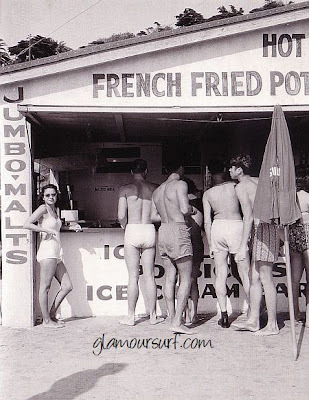 A fun example of matching women's and men's swimsuits. This photograph was taken in 1957. Jantzen Ltd factory at Lidcombe, NSW in 1953. Seriously, I'd have to go back in time, but I'd do it! 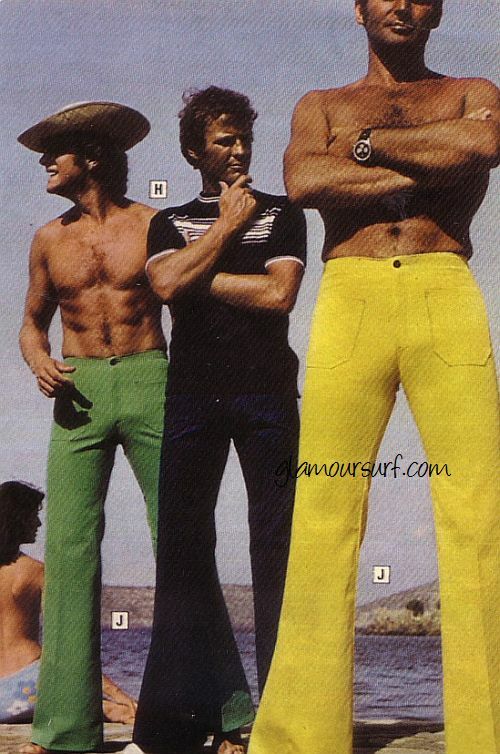 Check out those suits! The one with the large bow, swoon! 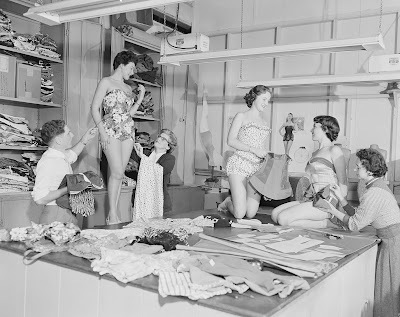 I just want to rummage through those shelves, look at the patterns and materials and try on some of these lovely swimsuits. A girl can dream. I jumped for joy today while researching something for my blog. 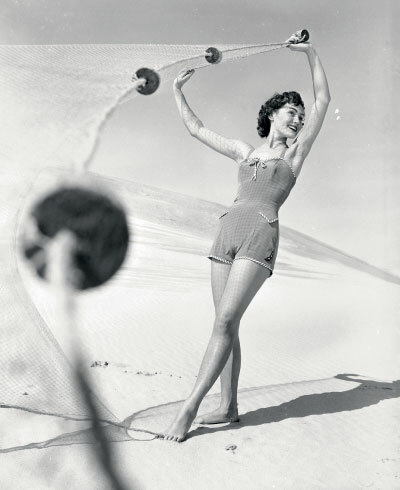 I came across this picture of a 1954 wool swimsuit by Claire McCardell. 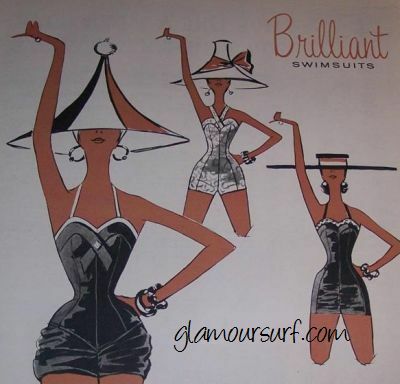 I had wrote about this piece being my holy grail here which I still have in my private stash of vintage swimwear pieces. 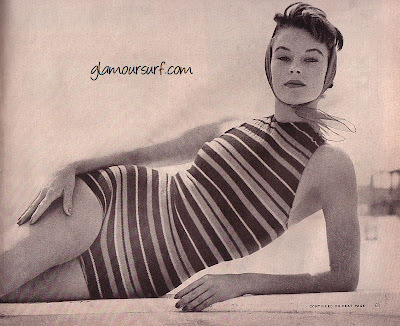 This high top knitted suit by Claire McCardell features strategically placed blue and red stripes. Cost in 1954 was $29.95. That's $242.00 in today's market, but this iconic piece is worth tons more to me. 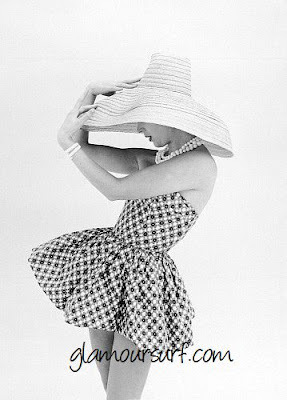 i just love it and am so happy to have found a fashion image of it. I love my job! 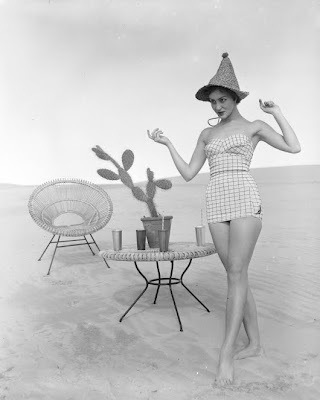 I am totally in love with this swimsuit and am waiting patiently for the magazine to tell me more. But oh, the ribbing, the sleeves, the silhouette. YUM! The gold swimsuit has always had a place in history, today we look at how it all started. 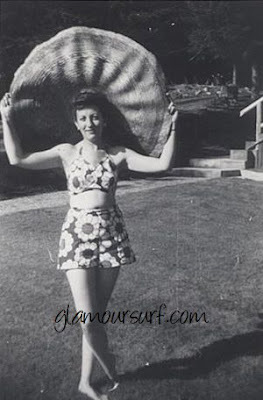 Rose Marie Reid was not shy when it came to making modest bathing suits and had a knack for knowing what would sell. Sometime in late 1945 or early 1946 Rose had developed a stunning new fabric for a swimsuit that would become enormously popular. While in New York buying fabrics she noticed a roll of metal yarn on the desk of a fabric company executive. It was being used for braids and trims. Rose Marie asked for a piece, took it back to her hotel, and dipped it in salt water, thinking if the yarn didn't rust, she would have it woven into fabric. When it didn't tarnish, she bought 20 yards of each of the silver and gold yarn, took the tread to a weaver and swore him to secrecy. 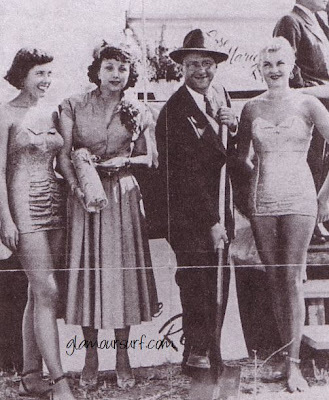 The debut of Rose Marie Reid, Inc., of California took place in Los Angeles on September 20, 1946. The feature finale was her beautiful gold metallic swimsuit. The suit sold for a whopping $90. (over $1000. in today's dollar), when most swimsuits at this time sold for $6.95. The metallic suit was the hit of the show and upset the market like a tidal wave. It was such a sensation that she had to turn down three out of four buyers. It was the feature of Apparel Week. Pictures of beautiful models wearing the suits appeared in newspapers all over the country. Rita Hayworth's studio bought one for her, and Rose Marie Reid was instantly famous. The construction of the Rose Marie factory had begun in 1950. She buried a time capsule containing one of the gold metallic suits that had made her famous. The capsule was to be opened in the year 2000. 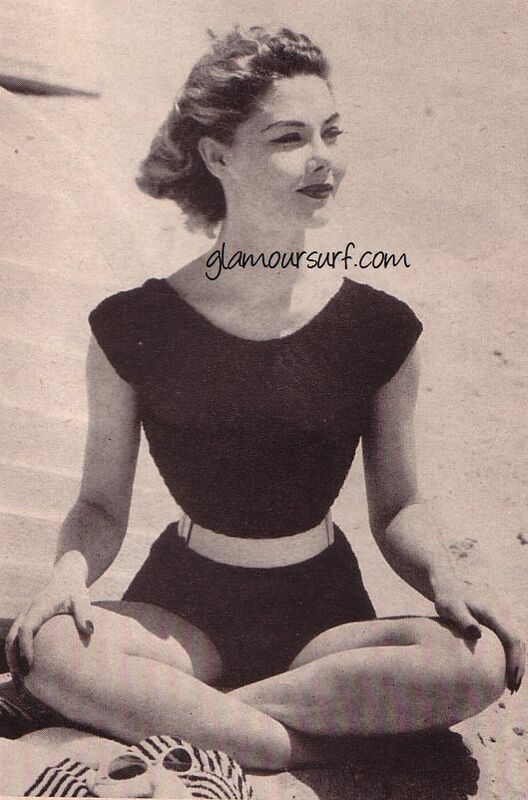 Rose Marie Reid also designed a precious metal swimsuit of black lace and 24 kt gold plating in 1951. This rarity sold for over $100 exclusively at Lord & Taylor that's over $800. in today's dollar. 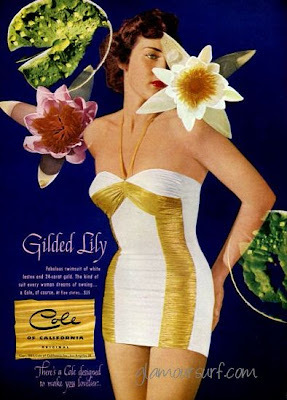 This ad from 1951 for Cole of California features the 'Gilded Lily' swimsuit made of lastex and 24 kt gold, yes, GOLD! Fast forward to 2007. Ginza Tanaka Jewelers in Japan unveiled a 24kt swimsuit. Designer Akihiko Izukura says that "It's designed to be swam in, but since we've never tried it, Ginza Tanaka has to take responsibility and they can't guarantee that it's ok." 500 grams of thread twined with 6 wires of 90 micron thin 24K gold. It took 32 days to make and is priced at $82,000! 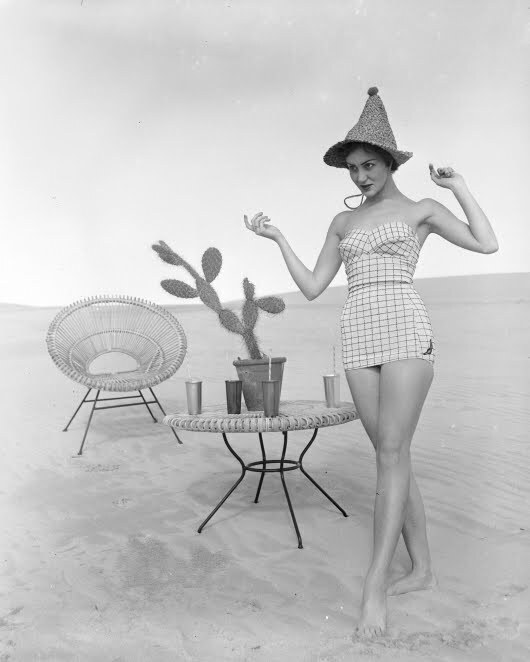 I'm sure there were earlier swimsuits that the Egyptians possibly made of gold, but we give credit to Rose Marie Reid.